Prominently standing high on a hill overlooking historic downtown Pendleton, SC, "Magnolia Hill" (c.1844), also known as the Ella Lorton house, is reported to be the highest point in Anderson County. This stately brick home captures beautiful views through large windows, with especially striking vistas of the front terraced garden and rear lawn. There is even a sneak peak of the mountains in the winter! The traditional "four over four" plan with wide center hall, tall ceilings, and multiple fireplaces, common for this period of construction, is reflective of elegant social gatherings of the past, yet adaptable for today's lifestyle as well. Frequent visitors to Magnolia Hill have included the families of U.S. Vice President John C. Calhoun and his son-in-law, Thomas Green Clemson, founder of Clemson University. The daughter of Thomas Green Clemson (granddaughter of John C. Calhoun) and Ella Lorton were known to be best of friends. 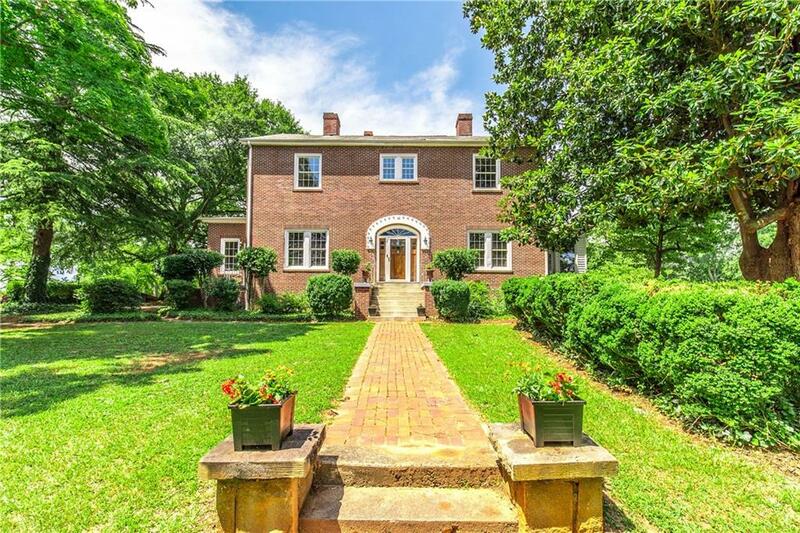 This 5 bedroom / 3 bath home not only has significant history with its past ownership, but also with its estate-like grounds. Legend has it that the boxwood garden on the front lawn began with boxwoods originally shipped from England in the mid 1800s, and the majestic magnolia tree within the garden was one of two transported from Florida and planted in 1880. With 1.06 acres, one might not realize that this estate is only a half block from Pendleton's historic Village Green. Around the Village Green, you will find multiple restaurants, shops, wine bar, bakery, and the Pendleton Playhouse, home to the well known Clemson Little Theater. The town itself is one of the largest registered Historic districts in the USA. A national magazine described Pendleton in this way: "one of the oldest communities stays young thanks to a downtown filled with unique shops and restaurants and nearby Clemson University." The home's location approximately 4 miles from Clemson University allows quick access to all activities on and around campus, from all sports to cultural events at the Brooks Center and the SC Botanical Gardens. Initially a wood frame structure, the home has seen many changes throughout the years including the all brick exterior added in the mid-1900s. Although other upgrades and additions have been made throughout the years, much of the home's original charm remains. Between the Formal Dining Room and the expansive Kitchen, the hand-crafted butler's pantry cabinet gives a glimpse to this home's history. The spacious Living Room, Dining Room and Center Hall lend themselves to good flow for entertaining, and enjoying the views of the grounds. In addition to 4 large bedrooms upstairs, the main level contains a cozy Master bedroom suite with access to the airy Sunroom and the Master Bathroom with jetted tub and separate shower. As you meander through this spacious home, notice the details of the stairway, a focal point from both the main level and upper level center halls. Additionally, the permanent stairs to the large attic as well as the fixed steps to the hand-dug cellar are indeed unique features to a home built in this era. Make an appointment soon to view this historic treasure.